OK, so it's a lighthouse tower, but in essence this is a classic 'dungeon delve', and that always makes for a good session of play. The idea is that the party is travelling about its own business when a vicious storm springs up, and the only structure they can see is a lighthouse, built to guide travellers away from a dangerous bog. Hopefully they'll try to take shelter there, despite a pile of gnawed bones that look pretty humaid by the door. If they don't there are a couple of ideas to help you convince them that going in beats staying out in the rain. There's a background story, some of which might be recalled through Bardic Lore or if a party member has local knowledge - no rumours, though, as the party's assumed to have come across the tower unexpectedly so haven't been asking about it in advance. There's more for the DM's eyes only, although if they find a journal that's lying around, some of it may come to light. There are some four levels to explore. Each room is provided with some 'read aloud' text and explanatory notes, as well as details (and stat blocks) of any creature in there. The additional notes cover things like the results of search checks, if any are made, and how events should play out over time if the party lingers. Some of the encounters can involve interaction rather than brawling - it's sometimes to the party's advantage to hear what the monsters have to say. They've been stuck here a long time, and have information to impart, things that will aid the party as well as themselves. It's a bit of a railroad, there's but one solution otherwise the party will be stuck here for good. If they don't talk to the right inhabitant, they may never guess what they need to do, so be prepared to offer hints. However, as a straight 'delve' this is a good one, the monsters are all there for a reason, coherence is good and it all makes sense. 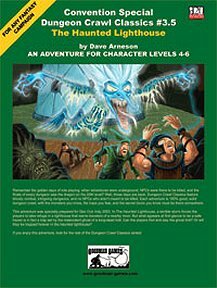 Originally intended as a convention module, it makes a good one-off or a side-trek adventure that should play out in a single session. Return to The Haunted Lighthouse page.